Another successful Geneva Marathon was held last Sunday. Congratulations to all our amazing marathon (and semi-marathon) running guests ! Once again the residence was fully booked. Our reception is going to get a makeover and from October guests will be able to enjoy its new welcoming and stylish design. 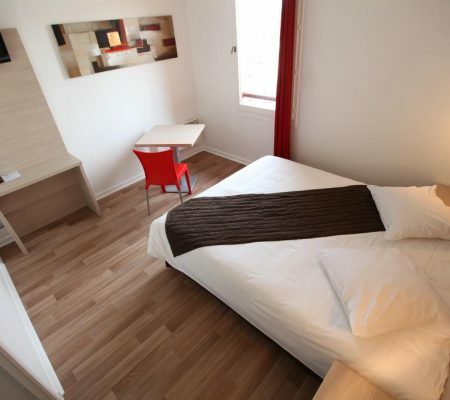 We continually upgrade and redecorate our flats so as to ensure guests have an enjoyable stay. Our studios are all of a superior standard and we'll shortly finish upgrading all of the flats. From 2019, trams will run from the Moëllesulaz border to Rue du Park in the centre of Annemasse. This leg will complete the Léman Express, which in turn will link Cornavin station to Annemasse station. The works are going as planned. This winter these works will be far from the residence, so you'll be able to enjoy a relaxing and peaceful stay !